NOT Your Father's News Release - Wylie Communications, Inc.
PR professionals have been married to the traditional news release format since Ivy Lee created the release more than 100 years ago. Why, then, do we need a new approach? With 2,500 releases going out each day — that’s one every 35 seconds — the impact of your traditional news release ain’t what it used to be. In fact, more than half of all traditional press releases never get covered, according to PR Newswire’s own research. In this PR writing workshop, you’ll learn current best practices from the Public Relations Society of America’s “national writing coach.” You’ll find out how to go beyond PR 101 approaches to write media relations pieces that get posted and published and reach stakeholders directly. Some 65% to 75% of city editors believed media relations pieces promote “products, services and other activities that don’t legitimately deserve promotion,” writes Dennis L. Wilcox and Lawrence W. Nolte in Public Relations Writing and Media Techniques. No wonder some studies estimate that 55% to 97% of all releases sent to media outlets are never used, according to Wilcox and Nolte. 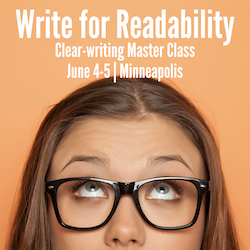 In this session, you’ll learn how to think like a reporter to develop story angles that readers want to read (and that journalists and bloggers want to run). Fill in the blanks to a great benefits lead: You’ll leave with formulas and recipes for crafting leads that sell the story and stand out from the crowd. Move from event to impact: Learn simple steps for transforming your event, speech or meeting coverage into news readers can use to live their lives better. Go beyond “new and improved” to information readers really want to know about your product. Steal secrets from Silver Anvil winners: What do nationally award-winning PR writers do that you don’t do? So: Are you building a compelling foundation for your PR pieces? Or are you still using structural techniques you learned when you were 19? Here’s the good news: In this session, you’ll learn to use a structure that’s been proven in the lab to grab readers’ attention, keep it for the long haul and leave a lasting impression. Steal a trick from The New York Times: Trade in your bloated fact packs for snappy synthesis leads. Build a better benefits lead with our fill-in-the-blanks approach. Avoid PR 101 leads: Still stuffing all those W’s and the H into the first paragraph? Still writing “XYZ Company today announces that …”? It’s time to move on to a more effective approach. Beat the boilerplate blues: Here’s one way to stay off The Bad Pitch Blog. So how can you get the wah-wah out and instead write quotes that reporters will actually use? In this session, you’ll learn how to transform your quotations from bleh to brilliant. Write tight bites. Even a lame quote will sound better when you use our quote length targets. Put a quota on quotes. Steal a trick from The New York Times to avoid overquoting. Write quotes that sound human — not like a computer spit them out. Avoid the worst PR clichés. PR Newswire sees 1,284 of these in a single month. Steal techniques from Silver Anvil winners. Make your sound bites sound better. 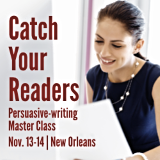 In this session, you’ll how to write tight, bright PR pieces that increase readership, coverage, sharing and more. Indeed, more than 70% of journalists spend less than a minute, on average, per release. That means they don’t read your message word by word. More likely, they skim. So how can you craft PR pieces that reach flippers, skimmers and other nonreaders? The answer is in your headline, deck, links and other display copy. These elements receive the most readership of all of the words we write. Yet too many PR pros blow off the display copy, writing some elements “the way we’ve always done them” and leaving out other elements altogether. 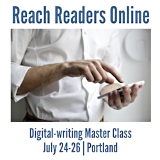 In this session, you’ll learn how to use your display copy to draw people into your PR pieces, make your releases more inviting and even communicate to flippers and skimmers. Steal techniques from Silver Anvil Award winning headlines. What do these winners do that you’re not doing? Make the most of the most important word in your headline. Test yours against our checklist. Write links that don’t get lost on portals. The best news release links are unlike any others. Do yours have the right stuff? Avoid Google’s wrath. Learn why Google News ignores one in five releases — and how to make sure yours isn’t next. And more … Get other PR writing best practices from the author of PRSA Tactics’ “Writing With Wylie” column. Bottom line: If you’re still using the SEO tricks you learned five years ago, you are hurting, not helping, your SEO. In this session, you’ll learn the latest best practices for optimizing your release to get found and read. Keep up with what Google wants. Panda, Penguin and Hummingbird. Oh my! Find out what SEO practices Google rewards — and penalizes — today. Avoid Google’s wrath. Avoid best practices from last year that Google now treats as gaming the system. The penalty: lower rankings. Link for SEO. Learn where to link, how often to link, how to write a release link (it’s different from every other kind) and what you must add to your links to avoid being penalized by Google. Optimize for semantic search. Now that Google’s gotten smarter, as well as tougher, keyword stuffing can’t help, might hurt. So what’s a writer to do? Write for search engine results pages. Help readers click on, as well as find, your release. Ann Wylie runs a training, editing and consulting firm called Wylie Communications. There, she works with communicators who want to reach more readers and with organizations that want to get the word out. Her workshops take her from Hollywood to Helsinki and to organizations like NASA, Nike and Nokia. She has earned more than 60 awards, including two IABC Gold Quills, for her communications. by March 18, to receive a full refund, minus a 20% handling fee. by April 18, to receive a 75% refund. Sorry, no refunds after April 18.